Do you have Osteoarthritis? Rheumatoid arthritis? Enlarged knuckles? Are your knuckles fine, but the finger behind them is small? I'm guessing your rings spin. I'm guessing you wish they wouldn't. I wish for your rings to fit you properly. This blog post is one of a series about what to do about rings and enlarged knuckles and making it all work. Have you ever said this? "I loved my wedding rings, but they just weren't comfortable anymore!" Thirty years ago I heard this from my Mom. I asked her why she wasn't wearing her beautiful wedding ring. She showed me a couple tiny white scars where her diamond settings had cut her skin while she was driving and the sideways ring dug into her pinky finger. Ouch. 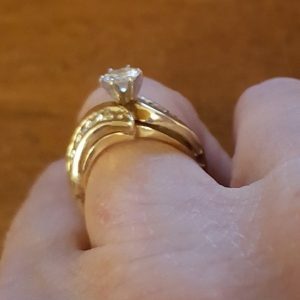 My mom got her ring out. It was two rings soldered together. She put it on and showed me how it couldn't stay upright. I could see that it was a shove to get it over her knuckle. Once on it just spun around. Clearly her knuckles were way bigger than her finger at the palm. My mom is a happily married woman and a beautiful one too. It was awful that she couldn't wear her ring. Her husband wasn't thrilled that she wasn't wearing it either. Something had to be done! I realized that this wasn't the first time I'd seen this. I'd sized a number of rings for people with prescription drug induces puffiness, people with old injuries that enlarged their knuckles and people with arthritis. I remembered wishing that their rings fit better once over their knuckles. 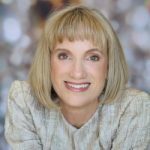 My mom's situation pushed me to reach out to the jewelry industry and find out what other jewelers did for people in this situation. I was referred to the Finger Mate company. Their smooth closing ring shanks that hinge open to go over the knuckle were exactly what my Mom would love. I showed her the brochure and said, "Let's do this." So we did and she wears her ring to this day. 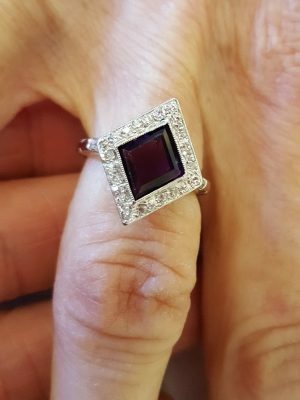 Once I did my mom's ring, I started noticing people not wearing any rings who had large knuckles. I'd reach out and ask why they weren't wearing rings. I ended up putting Finger Mate hinging shanks on for many people in my local area and around the US. I have been working with larger knuckled women and loving it as their hands are once again happily and comfortably adorned with beauty and symbols of love. 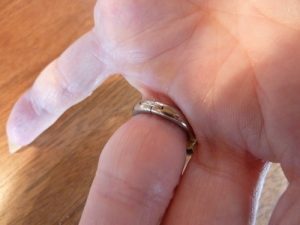 Whether you have enlarged knuckles, arthritis in the knuckles, or they are big from cracking your knuckles in your youth, or sports injuries, they present a problem with wearing your rings comfortably. Years ago my client Carroll had me put on a wider, more comfortable shank to make her diamond ring fit her better. Her knuckles had started growing and that first step worked for about five years. Then her knuckles grew larger. She had me size her ring larger. At this point her wide shanked ring was spinning. It was time to put a Finger Mate hinging shank on. This was the widest shank I'd ever used with the Finger Mate Hinge and I wanted to share with you the flexibility that is available. It's not a one size fits all deal. There are plenty of choices available. I asked Lana, another client, if she had any jewelry she wasn't wearing. It didn't have to be broken, just not worn or infrequently worn. 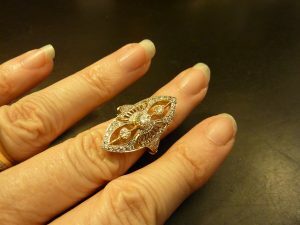 Out came this gorgeous filigree and diamond ring. Her knuckles were enlarged just enough to make it uncomfortably loose once it was over her knuckle. That was enough to keep her from wearing it. We put on a nice thin Finger Mate Hinged Shank to go with the delicacy of her ring design. Lana was jazzed and wears it a lot now. I've been asked if a few years go by will the hinging shank become too small. Petra was a client who had a two and a half size knuckle-to-finger differential when we first met. The hinging mechanism had room for a three size difference between the open and closed position. That became too small an opening after about eight years of daily wear. It turned out that Finger Mate was able to alter it to have a four size opening. We had them send the needed part and we installed it and Petra was back to wearing her ring happily. Her knuckle size had grown but the finger area behind stayed the same. My observation is that knuckles change, but the area behind the knuckle if anything shrinks. What if Your Hinging Shank Breaks? Happily they can be fixed. I have fixed two hinging shanks in thirty years of installing and servicing them. They are created to last and considering what we put our jewelry through, I'm impressed by the strength of the mechanism. If you are wondering why they hold up so well when there are moving parts, you're not alone. I've seen how ten years can wear down a thin shanked ring. Just a regular ring, not one with moving parts. When I asked, I found out that the inner mechanism which gets so much wear and tear, is made with harder alloy metals, but is 14kt gold. What Maintenance is Needed for a Finger Mate Hinge? If it becomes too stiff or too loose, have your installing jeweler give it a service. Often cleaning and re-oiling it make it as good as new. What if Your Ring is Platinum? 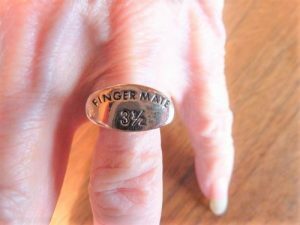 Finger Mate does offer platinum hinging shanks. What if You Have a set of Two or Three Rings That You Wear Together? 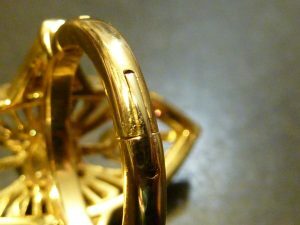 If your ring set is made up of very thin shanked rings, it's quite risky to hinge each of them not to mention expensive. 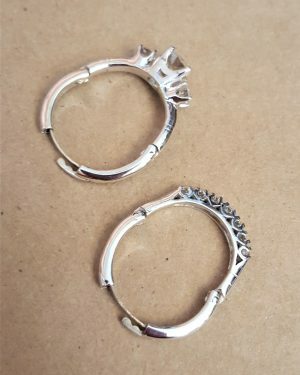 I recommend that for narrow shanked rings worn together, that you have them joined together before putting on a new hinge. In this case a hinge can be ordered that is wider and stronger and the rings always face up not facing every which way. 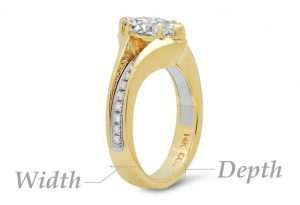 What if Your Ring is Thin and Delicate? What's too thin? Under 2mm is considered too thin. What do you do? I often start at the thinner upper part of your ring and blend in a gradually wider shank that will be able to connect with the minimum 2mm wide hinging shank. 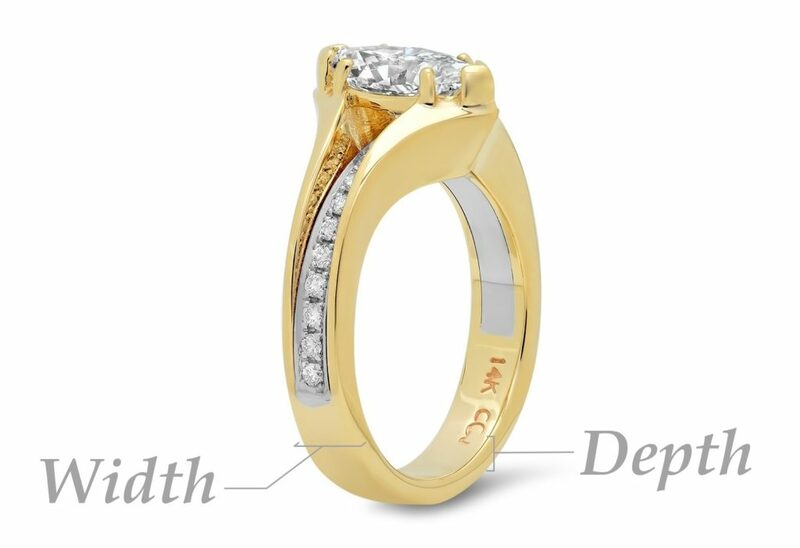 This is a customized solution and since each ring is different your jeweler should know what to do. 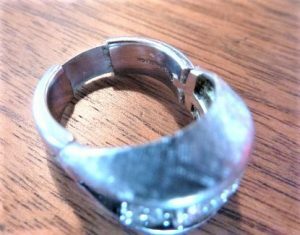 The depth of your ring is a factor in putting on a hinge as well. The hinge mechanism needs to be supported. If your ring does not have enough depth to support the hinge, a bridge will need to be put on. The bridge is put on underneath your ring in the top section. We make sure it is good looking. Since rings often have a nice taller side view, the bridge is installed to look like the normal design of your ring. It's important to work with a jeweler who knows hinges well, as if someone just orders the hinge and plops it on without making sure your ring is strong enough, something is going to break. How Much Does a Finger Mate Hinging Shank Cost? This is a tough question because there are different widths, different metals and rings that need bridges or alterations before they can accommodate a hinge. That said my average is between $1400.00 and $1800.00 per job. What's it Worth to Hinge Your Favorite Ring? If you have a $10,000 wedding ring that you used to wear daily. If you're not wearing it, it just became worth $0.00. Not that we measure our beloved rings in terms of their value. What I'm saying is if you're not wearing it, it gives you no joy. 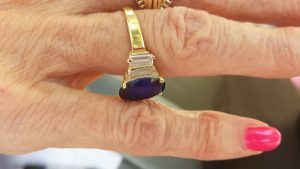 The smiles I've seen on clients when they put on a favorite ring that they hadn't worn in years is immeasurable. 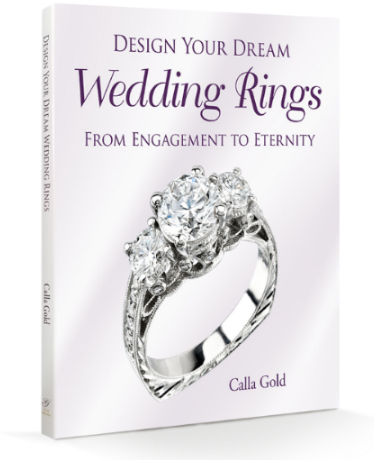 Many of my clients start with their wedding ring and come back with other beloved rings. I feel it is worth it to keep wearing your beautiful rings. A hinge can make the difference between your rings living in your jewelry box and joining you in your active happy life. 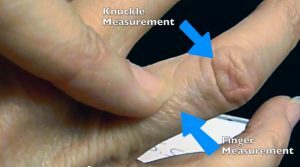 If you'd like to read more on your options for your rings and enlarged knuckles, there are more possible solutions below. Big Knuckles and Spinning Rings? Try the Butterfly Spring!